Southern Breeze, a group of Thai volunteer artists, will represent the northern region to spread Thai culture and tourism in Europe and will donate revenue for tsunami affected residents in southern Thailand. The Northern Dance Medley with the Fon To. To introduce Thailand’s answer to the Live Aid concerts, a press conference took place on July 12 at the Three Kings Monument, Chiang Mai Cultural Center. 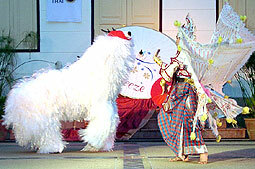 The show featured several Lanna style dances, with one, a Northern Dance Medley, featuring dancers with elaborate costumes, and a Fon To, a mystical creature from old Lanna folktales, which roamed around in the audience “sniffing” people and playing with the little children. 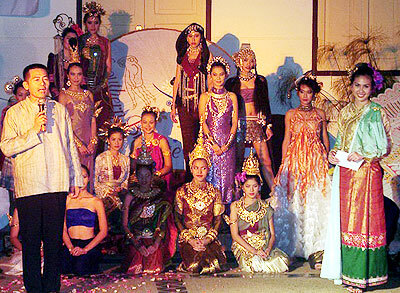 An elegant fashion show featured the many different types of traditional hill tribe clothing next to modern Thai-style designs. Southern Breeze consists of the new generation of Thai volunteer artists who all have experience in performing for Thai organizations abroad and call themselves ‘Southern Breeze’ as a reference to the air freshening wind that blows in southern Thailand. Prinya Panthong, vice governor of Chiang Mai, shows the artists encouragement and gives some words of advice. The volunteers have prepared a road show program to perform in the West, including Scotland, Germany, the Netherlands and USA, while other countries are will be added soon. The first tour will be from July to October 2005, accompanying an OTOP fair. The Office of Health and Development Networks opened its HIV activity center office on July 12 as a venue to gather information and facilitate the study of HIV. Tim France (center), director of Health and Development Networks, and his HDN team. The Health and Development Networks (HDN) is a non-profit organization and is registered under HIV Danger Reduction Foundation to spread information on HIV and other issues concerning health, by using the media. The center provides a library, meeting room, HIV information and advice and health checks, plus information on both Thai and overseas HIV organizations. It is available for researchers and those interested to exchange opinions about AIDS. The center is located at 22-22/1 Rajapakinai Road, T. Sripum, Chiang Mai, and opens daily from 10 a.m. to noon and from 2-4 p.m. Interested people can call for more information at 0 5341 8438 on weekdays. 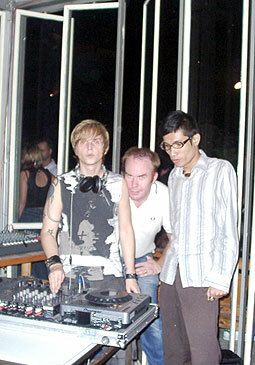 DJ Bee (left) and DJ David (middle) of the Futon band from England and DJ Wan from Mix Record Chiang Mai mixing music at Arctica Bar. The British Council in conjunction with Arctica and T.I.T.S. Radio FM 106.5 MHz organized the Club Tuk Tuk Launch Party on July 15 at Arctica Bar on Huay Kaew Road, to debut www.clubtuktuk.com, a website for music lovers updating hit music from England. Club Tuk Tuk is an online music community website, powered by the British Council to show the best of the UK music scene, with relevant connections to Thailand. The website picks up on the UK musicians performing in Thailand in their ‘What’s On’ section, and some of the best landmarks on the UK music scene are in their Interview section. Students of Suanboonyopathum Lamphun School won two gold medals at the world band competition in Amsterdam, Netherlands. On July 14, they returned to Chiang Mai to be met by a jubilant crowd and the congratulations of waiting relatives and friends. Congratulation Suanboonyopathum Lamphun School after wining two gold medals in the Netherlands. Niwatchai Ratchalert, president of Suanboonyopathum Lamphun School, said that the team had been Thailand band champions for 2003 and 2004, so the school was chosen to join the international competition against 26 other countries. There were five divisions in the competition, including show band star division, show band championship, marching star division, and marching star parade. He added that the team won show band star division and marching star division to receive the two gold medals. The audience in the Netherlands gave them a standing ovation. All costs of the trip were paid by the school, students and parents and some from donations and money raised be performances in town. Five million baht had been collected altogether, with no support from the generous government, despite its electoral successes in the North. After great anticipation during the two year wait, the latest installment of the Harry Potter series, Harry Potter and the Half-Blood Prince, was launched worldwide last week. 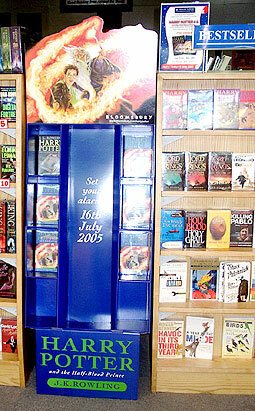 However, the release was not a very big deal in Chiang Mai, compared to Bangkok where avid readers were queuing at 5 a.m. On the afternoon of the release day, most local book shops were still fully stocked with the sixth Potter book, and on Monday afternoon the bookstore shelves were still stocked. Perhaps through better marketing or pre-event publicity, the Bookazine Book Shop at Central Airport Plaza was the only shop in town where a real difference could be seen, 30 of their 40 copies had been sold as soon as their doors opened on Saturday morning. Surprisingly too, 70 percent of the buyers were Thai nationals who purchased the English release. In Harry Potter and the Half-Blood Prince, several new and important things happen, including the dramatic death of a main character, (who you have to find out reading by yourself), romance for Harry and his friends, and the answers to many questions the readers have been asking. The book’s main characters have matured much since the first book. Although teenage and adult fans of the book won’t have a problem with it, the younger readers might think it has grown a little out of their league. The new release is even more dark and scary than the first five. 607 pages long, it is priced between 650-680 baht. To anticipate Bastille Day (July 14), the National Day of France, Dr. Louis Gabaude, director of the L’Ecole Francaise d’Extreme-Orient opened the wooden gates of the prestigious property on the western bank of the Mae Ping River on Charoen Prathet Road on July 11. Dr. Louis Gabaude personally welcomed the many illustrious guests and scholars in company of Thomas Baude, the Honorary Consul of France in Chiang Mai. From left Mrs. Penth, Mrs. Heather Glendinning, Finish Hon. Consul Dr. Supavat Poovakul, British Hon. Consul Jon Glendinning, Governor Suwat Tantipat, Chamaiphan Baude, Dr. George Sioris, Dararat Shinawatra, Jumpol Chutima, Dr. Hans Penth. It was a dinner reception, and 90 guests were feasted under the shades of century-old rain trees. Dr. Louis Gabaude used the opportunity to officially announce the expansion of his scholarly duties. Besides taking care of the important library of the L’Ecole in Chiang Mai, he will go for two weeks each month to Vientiane, the capital of Laos, to manage a project to modernize the facilities at the National Library there. The more than 100 years old institution of the L’Ecole Francaise d’Extreme-Orient, with its headquarters in Paris, also has a branch office in Vientiane. 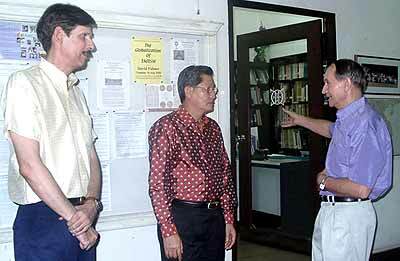 Thomas Baude, the Honorary Consul of France in Chiang Mai, Suwat Tantipat, governor of Chiang Mai and Dr. Louis Gabaude, director of the L’Ecole Francaise d’Extreme-Orient. Another change concerning the daily routine in Chiang Mai will be the arrival of the French scholar Dr. Francois Bizot, who had build the fine teak wood house on the premises in Chiang Mai in the 1970’s. He will use part of the house as his private residence in the future. Together with French residents in the North, expatriates from many other nations and Thai VIPs, they remembered Bastille Day, the French National Day. This special day on July 14, 1789 – seven years after the founding of Bangkok by Rama I of the Chakri Kings – highlighted the French Revolution and the elimination of absolutism, when a furious mob stormed the Bastille Prison in Paris. The expenditure of court, army and administration had produced a huge deficit in the country and the people took their own decisions against an irresolute king. This action changed and influenced forever the history of the whole of Europe. The artistic community of Chiang Mai combined in a rather different way to bid farewell to John Morgan and Guy Pace, both having to leave their chosen second home for temporarily returns to the UK and the US respectively. As their circle of friends outnumbered the given capacity of both their homes, they agreed to co-host the party at ‘La Luna Gallery’, a fact that added even more color to an already colorful group. 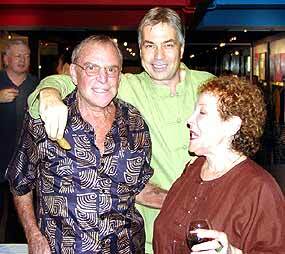 Second host of the evening, John Morgan (rear) saying his farewells to Bart and Ronnie. Wines and Mediterranean snacks were on offer, and even a short power cut did not dampen proceedings, but probably brought people closer together. Following restoration of the power, guests returned to admiring (and buying) paintings and artifacts on display. La Luna Directors Sommai Lumdual and Lasse Norgaard have made it their personal obligation to show off some of their finest contemporary art pieces SE Asia, and to also show that La Luna is a community venue encouraging and supporting the local art scene. An impressive international group (from left), David Levitt, Ogilvy & Mather Hong Kong; Guy Pace, asst. exec. 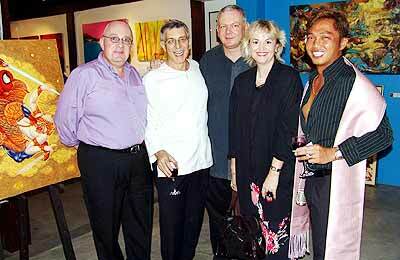 director Actors’ Equity Associates New York; Lasse Norgaard, La Luna; Marion Vogt, Chiangmai Mail and Panomporn ‘Ice’ Sawaengsap, F & B restaurant manager Oriental Hotel Bangkok. The third in the local concert series will be held on Friday August 6. The performance will be one night only, in the Kad Theater, Kad Suan Kaew Department Store, and there are only 1,500 seats available. Pol. Capt. Suchai Kengkankha (wearing suit), MD of Kad Suan Kaew and Thianchai Sooktiang from Voice Studio at the press conference. Nurak Nonsi, president of Northern symphony orchestra said that this concert includes 45 Northern musical artists and actors and actresses all from local areas, plus Joan Eubank, a former Broadway actress and Rang Rockestra, a Thai artist, who would join the show. Ticket prices are at 700, 500 and 200 baht (more information at 0 5389 4498, 0 5322 4444 # 19008 or at Voice Studio, 0 5341 0123 and 0 53602 4441).